The UMSL Triton Store is part of the University of Missouri Campus Stores. By sharing services, we have achieved lower prices on course materials and expanded merchandise selection. Most importantly, the Triton Store's profits stay at UMSL to support campus programs and initiatives. Textbook costs – On average, how much do students spend on textbooks each semester? 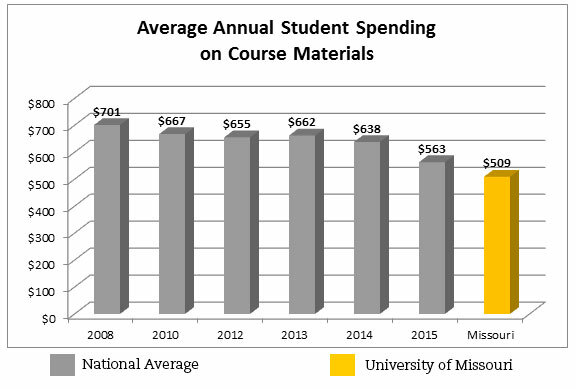 At University of Missouri Campus Stores, students spend an average of $509 on course materials annually (approx. $254.50 per semester), which is just under 10% less than the national average of $563, reported by the National Association of College Stores. This does not include monies paid back to students when they sell their textbooks back at the end of the semester; if the textbook is being used by faculty the next semester, students can be paid up to 50% of the new book price. What are we doing to provide cheaper alternatives? Four campus centralized course materials buying results in more used and rental books from students across the network—saving students money by buying books back at a higher price and providing more used books for purchase and rental programs. The UM Campus Stores collectively rank first in the nation in the number of rental units and digital book sales and second in the nation in the number of used books available to our students. Rental options save students up to 50% off new textbook prices; the UM Campus Stores offer rental options on over 50% of titles. Digital alternatives can save up to 52% off new textbook prices. 38% of textbooks sold at the UM Campus Stores are digital. Used books save 25% off the new book price. Almost 40% of all books are available used. In the last three years, UMSL students saved $1.5M through rental, used and digital programs. The UM Campus Stores offer online price comparisons, which allows students to compare our textbook prices and competitor prices on the website. 94% of our online customers choose us after comparing prices to multiple online sellers. In 2014, we launched AutoAccess, a partnership with our stores, publishers and faculty that provides course content via the campus learning management system (LMS) at a reduced cost. Pilot programs were launched in fall 2014 with McGraw-Hill and Campus e-Bookstore, Inc. Since then, we have added Pearson, Cengage, and VitalSource to continue to grow and expand AutoAccess. Students enrolled in these programs saved $1,363,928.89 (compared to new prices) since the program began. We are working with faculty and university libraries to facilitate print on-demand books for students who wish to obtain an inexpensive copy of OER materials. We recently gained capabilities to distribute digital OER content through a 3rd party platform and participate in a campus OER committee that is working to identify areas to further reduce the cost of course materials. Collectively, these programs saved students on all campuses almost $7.7M when compared to new prices. Supporting Students Through Employment Since 2010, student wages at the UMSL Triton Store totaled $307,005, or approximately $104,000 per year to assist with the cost of education. We provide over $6,000 in employee textbook scholarships each year. Students can print their booklists in the store. The list is organized alphabetically by author, which mirrors the textbook floor. The course and section are listed with the book information, which should aid students in selecting the correct title when author names are the same or similar. Staff are available to answer any questions and provide assistance.